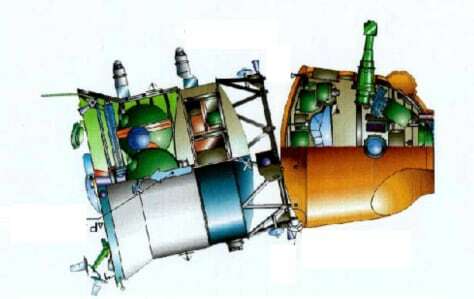 This schematic shows the two parts of the Soyuz spacecraft, the propulsion module at left and the crew capsule at right. Russian space officials have told NASA that during the past two Soyuz descents, one of the connections between the two modules did not initially break away, as shown in the schematic. Next month's spacewalk is aimed at heading off a repeat scenario.